AMD today announced the launch of its 2nd-Generation AMD A-Series Accelerated Processing Units (APUs) for mainstream and ultrathin notebooks, as well as All-in-One and traditional desktops, home theater PCs and embedded designs. The 2nd-Generation A-Series APU, codenamed “Trinity”, is supposed to be a “grounds-up improved design” over the previous generation (Llano), which according to AMD, enables “best-in-class PC mobility, entertainment, and gaming experience.” A total of five SoC AMD Fusion APUs were released, with three mainstream laptop 35W processors, as well as two 25W and 17W ultrathin laptop processors. The new AMD Fusion A-Series APUs promise double the performance per watt of the previous generation, and an increase in CPU performance up to 29 percent. 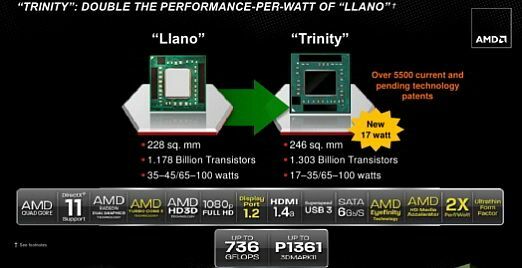 All this is possible with the new AMD Piledriver and its 3rd Generation Turbo Core technology, dynamically clocking the GPU and CPU, and capable of boosted CPU frequencies up to 3.2GHz. AMD’s Start Now technology should ensure a resume time as little as two seconds, boot time as little as 10 seconds. Graphical performance has also been improved, with AMD promising an increase of 56%, using the new AMD Radeon HD 7000 Series graphics. According to AMD, combined, the CPU and GPU cores deliver more than 700 gigaflops of computing performance, which is several times more than the fastest x86 CPUs. AMD Eyefinity technology is also onboard, without the need for a discrete GPU. With AMD Radeon dual graphics however, AMD says that a performance boost up to 75% is possible. Also onboard is the new AMD HD Media Accelerator, with new and improved AMD Perfect Picture HD, and AMD Steady Video, and the new AMD Quick Stream technology, and True HD video chat with up to four people at once. 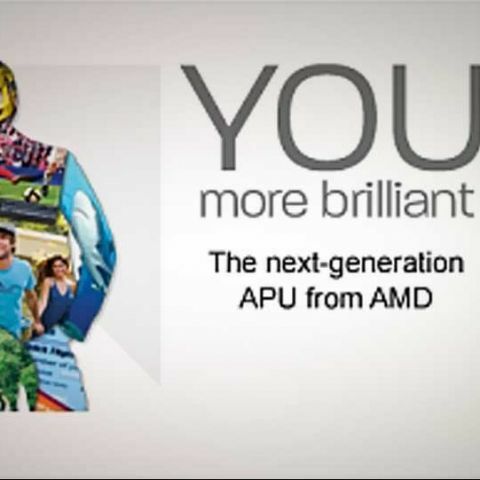 With the announcement of the 2nd-Generation A-Series APUs, AMD is emphasizing on the vibrant developer ecosystem for the AMD Fusion platform, enabling over 100 applications and games to be accelerated by AMD APUs. The new A-Series will provide superior Web-based video experience, with new plug-ins for Chrome, Firefox and IE9 enabling AMD Steady Video technology. Recently optimized applications include Photoshop CS6, WinZip 16.5, and VLC Media Player. AMD says the A-Series APUs are also well-positioned to take advantage of the upcoming transition to the Windows 8 operating system. The first AMD 2nd-Generation A-Series APUs will begin shipping with Acer, Asus, HP, Lenovo, Samsung, Sony and Toshiba devices, starting today.